Despite floods, farmers of Rangour region have produced 17.21-lakh tonnes of Transplanted Aman (T-Aman) this season breaking all previous record of yield. 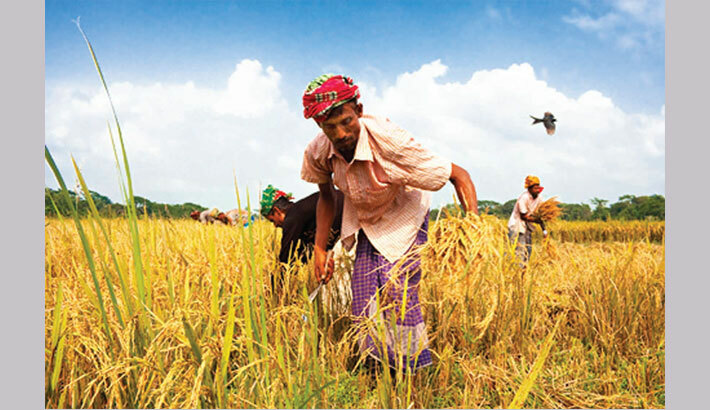 Horticulture Specialist of Department of Agricultural Extension at its regional office here Khondker Md Mesbahul Islam said the DAE had fixed a target of producing 14.59-lakh tonnes of T-Aman rice from 5.26 lakh hectares of land in Rangpur, Gaibandha, Kurigram, Lalmonirhat and Nilphamari districts this season. The farmers had cultivated T-Aman on 5.93-lakh hectares of land exceeding the fixed farming target on 5.26-lakh hectares of land by 66,797 hectares. "The achieved average yield rate of T-Aman rice stands at 2.90 tonnes of clean rice per hectare with 3.34 tonnes per hectare for hybrid variety, 2.94 tonnes for high yielding variety and 1.71 tonnes per hectare for local variety Aman this season," Islam added. The farmers brought over six-lakh hectares of land under T-Aman farming by August but the subsequent floods submerged growing plants of the crop on around 2 lakh hectares of land. "However, the farmers re-transplanted Aman seedling on 52,681 hectares of land, completed gap filling on 99,989 hectares and transplanted on 39,117 hectares of fresh land after floods to exceed the fixed farming target this season," Islam added. Regional Additional Director of DAE Shah Alam said the "The visit of Prime Minister Sheikh Hasina during the floods to affected Dinajpur, Kurigram and Gaibandha and distribution of Aman seedlings by her highly inspired flood-hit farmers to exceed farming target of T-Aman crop in this region." Talking to BSS, farmers Aminur Rahman, Shachindra Nath Roy and Abu Bakker Siddique here said they completed Aman harvest last week and got bumper yield of the food grain.